When she first walked into the gym, there was nothing special, just a skinny girl starting out as all kids do by learning the stance, the move and the punch. A quiet girl with nothing really standing out at the time, you could be forgiven for thinking that this would be another one that would last a few months and then be off doing whatever kids these days do, I couldn’t be more wrong and more than once she’s on a pedestal to show just what you can do when you dedicate yourself and push your talent every time. Acacia Barron started at the People’s gym a few years ago, I was still a while away from getting my coaching badge and was helping out on the pads during the under 10’s session keeping the little un’s busy as Kieran took them one at a time through their paces in the ring. Acacia was a very quiet girl that listened intently and improved slightly each week, no different to anyone else that comes through the door and whilst there was something there you couldn’t quite figure out what it was and at the time there was nothing to suggest the talent that was hidden inside. She stayed with the kids for a while and then seemingly disappeared one week, no biggie it happens all the time as kids come and go and decide it’s not for them. My two got bigger and better and were moved up to the juniors class where surprise surprise the little skinny kid had gotten a little bigger but a lot better, there was a quiet confidence brimming under the surface and if the girl herself didn’t know it then the coaches (still not me yet) sure did, she was now training hard and pushing herself to the limit she’d be outside the door waiting for it to open and picking brains as she was the last to leave, her mum and dad often there shouting her on as she started to spar with some of the lads and coming back for more and more despite leaving the ring more than once with a spattering of blood across her face, a determination coming through as she refused to be cowed by anyone. At this point she was still at a level where my lad could get in the ring with her and not be completely embarrassed, one of his defining moments was actually landing a few punches and causing a trickle of blood to leave her nose, something she won’t remember but we won’t forget (she was that good then). The little girl turned into a ferocious fighter in the following months as she moved up and past every person in the gym, something special was showing itself and it was how to bring it out, I was now coaching with a lad called Tabby, Kieran was pushing his professionals and Acacia was still doing her thing and pushing on for bigger things, enter Nathan Farrell, devastated after a knee injury had curtailed his own career he needed something to keep his head up and something to aim for. It was to be the catalyst for the champion to step forward as Nathan is a notorious perfectionist, you have to be on top of your game at all times and if you lose a step he’s not shy in stepping forward to tell you. Would the still shy girl adapt or falter? well she shined stepping up to the plate and learning more and more whilst asking for extra sessions. Kieran and Nathan to their credit pushed the girl to her limits and every time, she found another step and another level that moved her away from the rest of the pack. A lot of kids knowing this and being told this may have lost their heads a bit, let the arrogance seep in and become a nightmare but Acacia whilst knowing how good she was never let it overtake her and was still an absolute pleasure to coach (I say coach I think she was helping me more), I remember my daughter taking a couple of hard punches from one of the lads taking advantage during a blocking session which knocked her confidence for six (I still believe it was a ‘I can’t get your brother so I’ll get you), she was in absolute bits for weeks and was really wavering on boxing so one week Acacia took her to one side and worked with her, the kid gloves were on and the maturity shone through as come the end, my daughters confidence was high again and Acacia had shown a softer side you would never see in a competitive match/spar. More than likely a fleeting moment that she won’t remember but she gave another girl her confidence back and a chance to make the most of her talents, something we won’t forget. This time she’d started having fights mostly away from home and travelling around the North West and Midlands due to female boxing still growing it’s became increasingly harder to find opponents as people didn’t want to face the whirling dervish that could move through the gears at will and the whispers began that she could be one of the best girls in the sport. In 2016 she fulfilled one ambition as she travelled to Birmingham (CHECK) and won the National championship against a much larger opponent as hers (surprisingly) hadn’t shown up and neither had her opponents, coach Nathan said they’d said yes to it after Acacia insisted. A wise choice as she won handily on the cards and could now add champion to the other plaudits given to her. The hunt for opponents was still tough but she was out when she could be and travelled around sparring when partners could be found. In 2017 she cemented her position as one of the best talents as she defended her 2016 title and won once again on points. 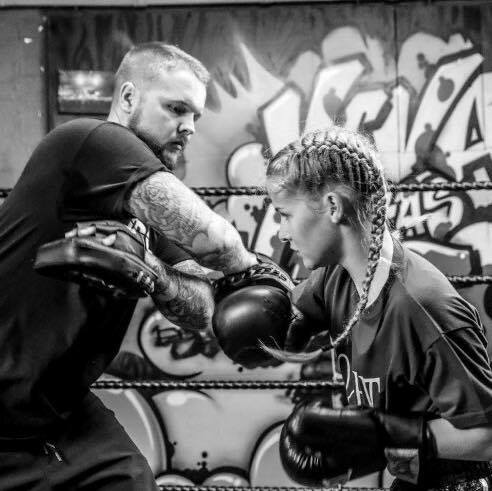 The girl was doing well, training whenever she could and running in her own time to keep the fitness up (Kids if your gonna box, you gotta run, trust me). There were discussions on what could be next as the amateur side to the gym had dropped off and we were struggling to keep hold of all ages as boxing seemed to fall by the wayside in the area. Never letting up Nathan kept her busy and then disaster struck, Acacia was beaten in another championship fight by 2 rounds to 1, Nay was brutal in his assessment that whilst it was a close fight she lost it herself rather than getting beaten (from memory Acacia threw very few punches in the first round which cost her). What would happen next for the pint sized puncher? had the halo slipped and would the criticism turn her away from the sport she’d put so much into? (what do you think 😊 if you’ve got this far then you know she came back to the gym and was straight back in the ring training with the young lads and trying to right the wrongs.) A new Acacia was in the offing and this time there’d be no mistakes. Another proud moment for Dad was the wee lad being given another opportunity to spar with her but this time it wasn’t the little girl it was the champion, despite being outclassed for the first round he came into his own in the 2nd and 3rd round and got a pat on the back from Acacia and Nathan (a rare occurrence) and left with a massive grin and a promise that next time it’d be closer. The champion was soon to disappear every once in a while after this but we all knew where she was now as she’d been called up to train with the GB squad, a massive honour indeed and something she is (and rightly so) extremely proud of. As the year came to a close the champ came down with a virus and unfortunately has been unable to train fully for a while something to break anyone else’s spirit maybe but the girl goes from strength to strength as she’s been picked to participate in a box off for the Schoolgirl European championship. Whilst still ill, she’s been back in the gym to buck the youngsters up and has shown that whilst not even near her best she’s still more than a handful for all (I would say unluckily but I’m glad my lad wasn’t involved as I want him to do well against the best, not a shell). Talking to coach Nathan you can tell she has a big impact on those around her as we lamented the things year 9’s get up to now, with a seeming insistence on growing up quickly gravitating to the streets with drink and drugs is more a norm in the area than ever, Acacia as always is having none of it and prefers to keep herself ready and able for whatever challenge may pop up. The girl has a massive future in the sport be it amateur or professional and in time someone better than me will give her a massive write up and show the world that the Baroness always knew her destiny was at the top whilst dragging those around her up as well.